Beni Khiar is a small fishing port about 4km east of Nabeul on the Cap Bon peninsula. Its population in 2004 was almost 17,000 residents. However, it has significantly expanded since then with a boom in the building of houses, villas and shops at Beni Jinen Khiar to cash in on local tourist demands. 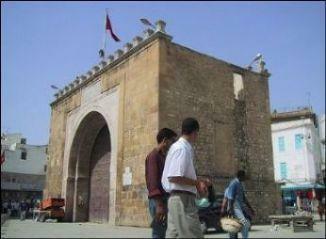 The town falls under the governorate of Nabeul which administers the local administration. The port was chosen as an experimental zone for a desalination plant to test using solar power to desalinate the sea water. Beni Khiar is well-known for its wool-weaving and it produces woollen blankets, clothing and kelims which are popular with locals and tourists alike. Men spin the wool and operate the looms by hand and then tailor the fabric into jackets. Carpets and rugs are also produced along with colourful embroidery. The goods are sold on local stalls. 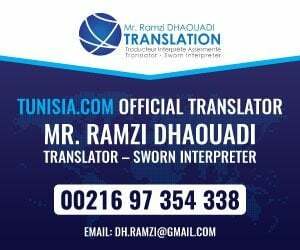 The business is operated as a weaving centre under the Cooperative des Tisserands el-Faouz. 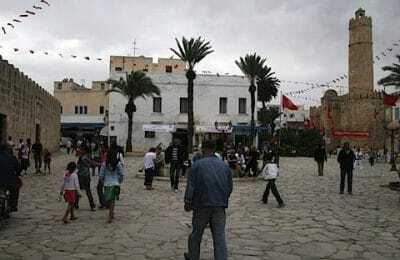 Beni Khiar is a town which is growing in popularity with the ex-pat community being close to all the conveniences of the cosmopolitan town of Nabeul yet enjoying a quiet rural existence. Wandering through the narrow winding alleyways, visitors are likely to see local weavers with their looms hard at work in the shade.The high street in Beni Khiar has all the required amenities – a post office, essential shops, doctors, dentists and other requirements for modern-day living. The Saturday market sells local fruit and vegetables and the main market is held on Sundays. Stallholders tend to be friendly and helpful and most are happy to practise their English skills with tourists! The town has good educational facilities with a high school, college and four primary schools. There is also a very reasonably priced nursery school. Outside the town centre the countryside slopes down towards the sea. Gardens are filled with orange, pomegranate, fig and olive trees which flourish in the sunny Tunisian climate. The traditional port is very picturesque and the perfect place to buy fresh fish early in the morning. There is a lovely long sandy beach and a shady beachside café with a garden. The beach is particularly busy later in the day when the locals come down after work to cool off and socialize. The port also has an old-fashioned pirate boat which offers cruises to Hammamet with an onboard party of music, food and entertainment. One of the main festivities in Beni Khiar is the annual festival of liturgical (religious) music which takes place during the first week of Ramadan. The festival was initially created by Mohamed El Habib Boutiti. Beni Khiar is well known in sporting circles as it is home to several national and international handball players such as Marouène Maggaiez. The local gym is named after local sportsman Derdouri Hamadi and the town also has a youth centre. Getting There and Getting AroundFrom the main P1 take the C28 to Nabeul and then the C27 the last 4km to Beni Khiar. The 1.5km between the town centre and the beach can be done either on foot, by taxi or by local bus. Beni Khiar is mostly residential with no hotels and just a few ex-pat villas. Nabeul has several local pensions and larger hotels such as 3½ star Les Pyramides and the older Hotel Kheops, but Hammamet offers the best choice of tourist hotels. The town has a few local bars and restaurants which cater mainly to local tastes. There is no real nightlife as such in this small town.Climate in Beni KhiarThe driest months to visit Beni Khiar are between April and October when temperatures range from 20-32C (68-90F). July and August can be hot and humid. Winters are mild but showers are more frequent. Nearby Hammamet and Nabeul have several banks for exchanging foreign currency and making withdrawals with Visa or Mastercard. Driving is the easiest way to get to Beni Khiar. The local bus service is very good from Hammamet.